On Mother’s Day Martha, Franny, and I took an early morning walk in Highland Park. 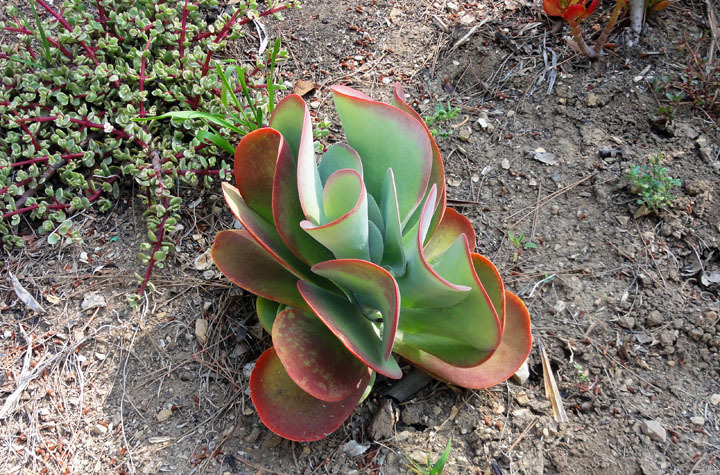 Highland Park is nestled in the Arroyo Seco that runs north from Los Angeles to the Angeles Mountains. A main boulevard, a freeway, a passenger rail line, and a river run through the arroyo. 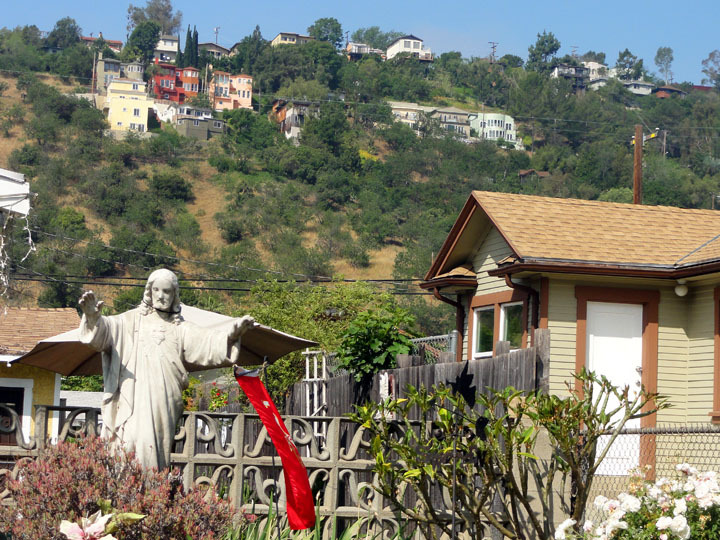 We drove to Highland Park and hiked up its western face to explore this modest latino community that is slowly being gentrified. As we set out we were greeted by a fascinating sight looking toward the western slope of the arroyo. This would be a beautiful hike! 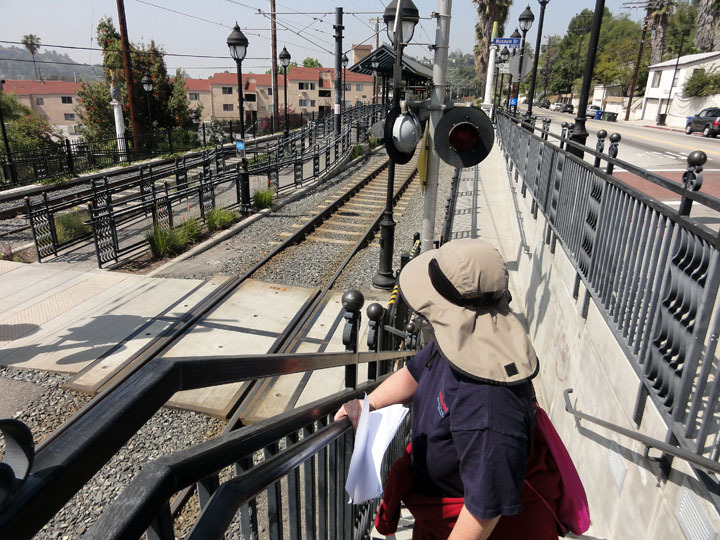 Crossing at the Gold Line passenger rail station, ready to hike up. 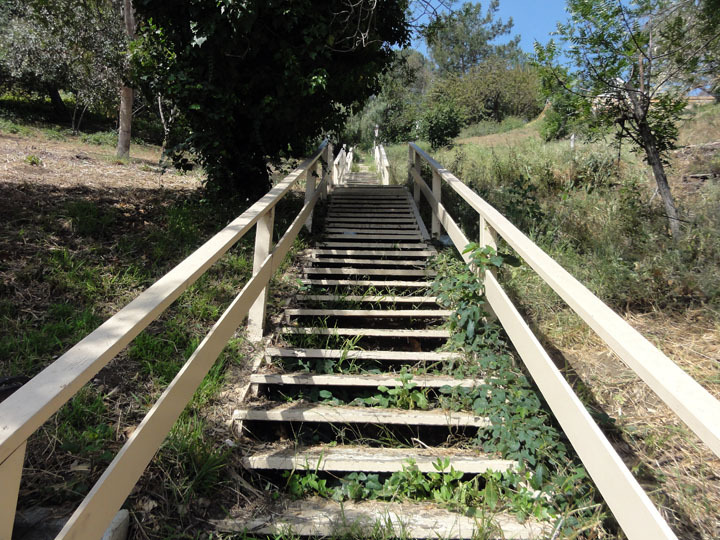 At the top of the hill we encountered a 200 step wooden staircase. Locals assured us that the climb up was worth the effort. We climbed it. Here we are on the rim of the Arroyo Seco. Martha is looking down on the Gold Line train tracks. 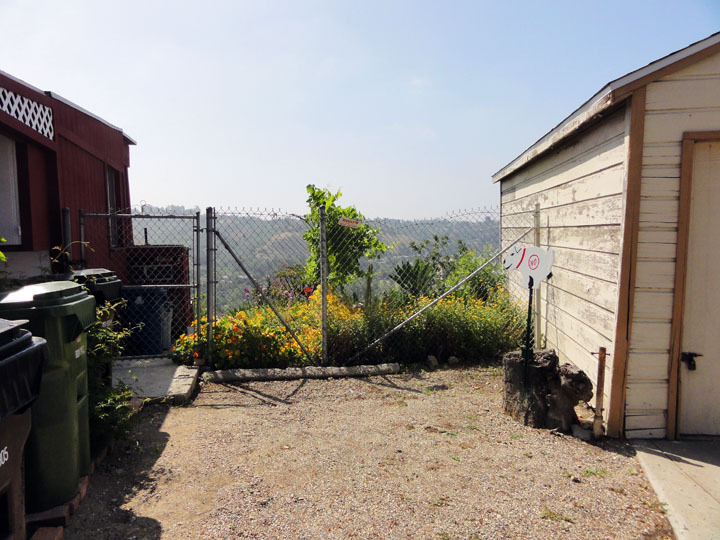 A view between modest homes along the rim, overlooking the arroyo. Our walk was full of surprises. 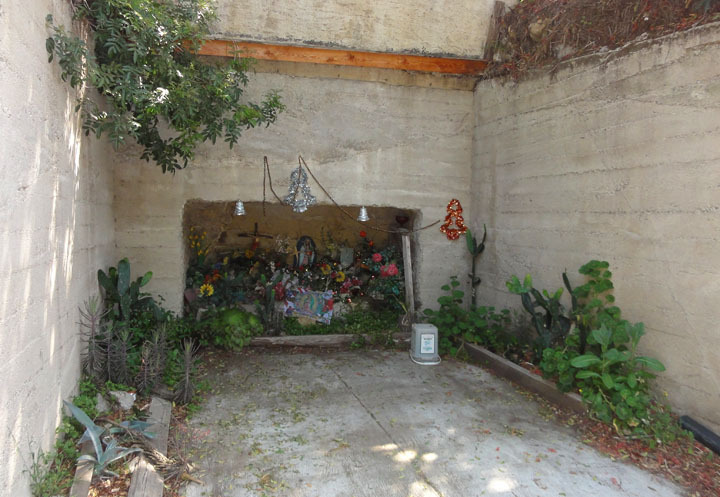 Here’s a shrine to the Virgin of Guadalupe set in an abandoned car garage. 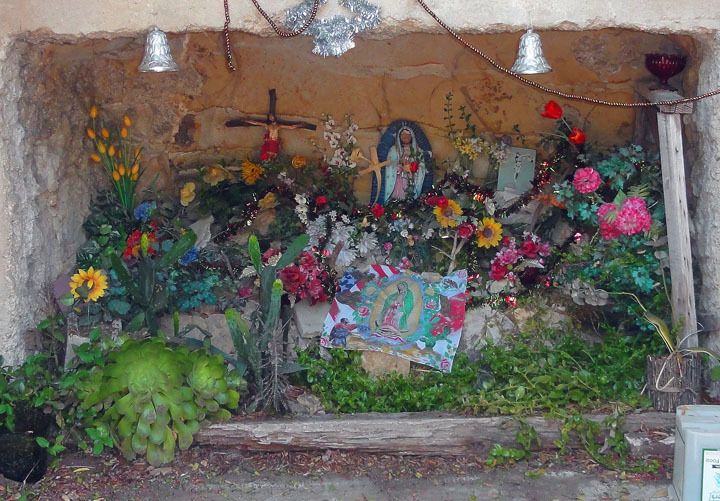 A close-up of the shrine. 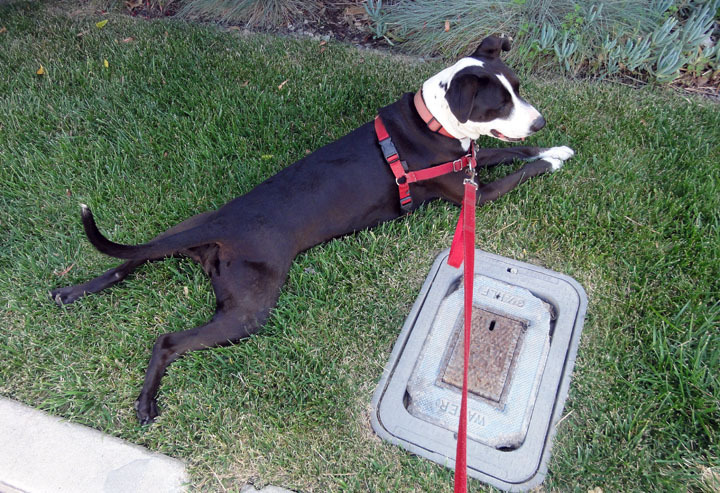 Franny heated up on the hike, so she’s cooling off here on some damp green grass. On the hillside were encountered mostly residential neighborhoods, and as we descended back to our car we walked through more public spaces. Here are a few scenes from Figueroa Street, the main boulevard. 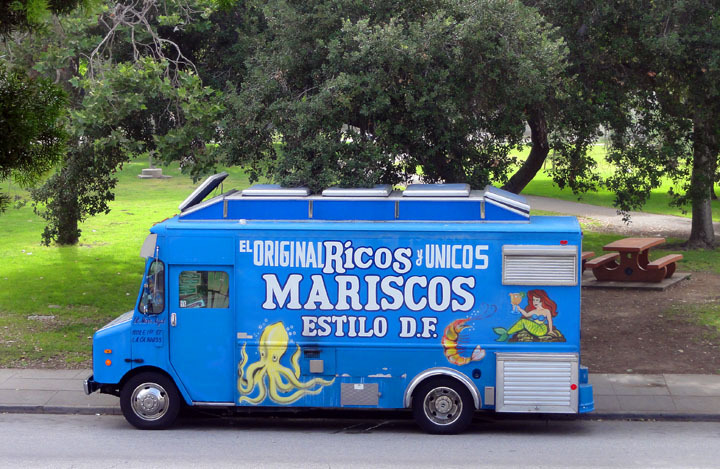 A food truck with a cephalopod theme. This picture was taken for Richard Davidon, of Palm Springs. 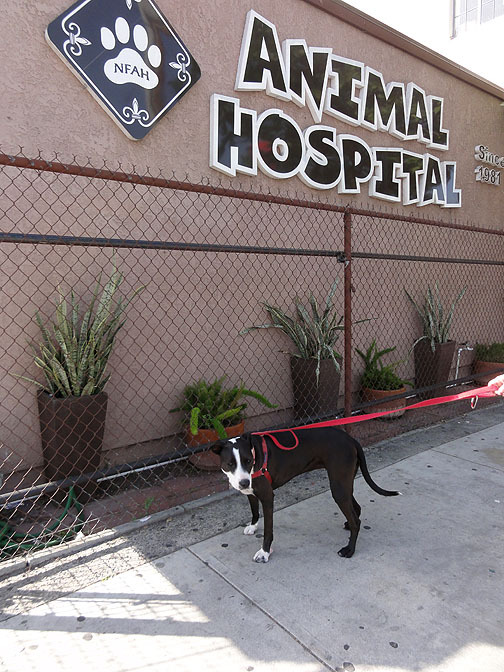 Our walk took us to where Franny was neutered three years ago when she was a puppy. 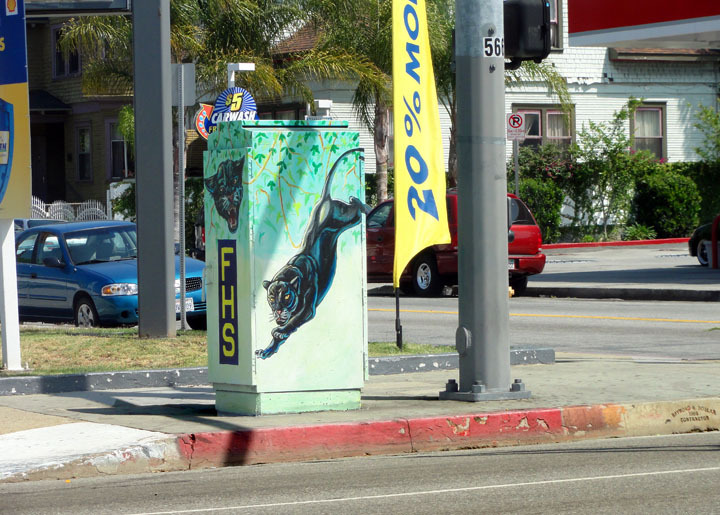 A utility box with a painting of a black panther, the mascot of a local high school. 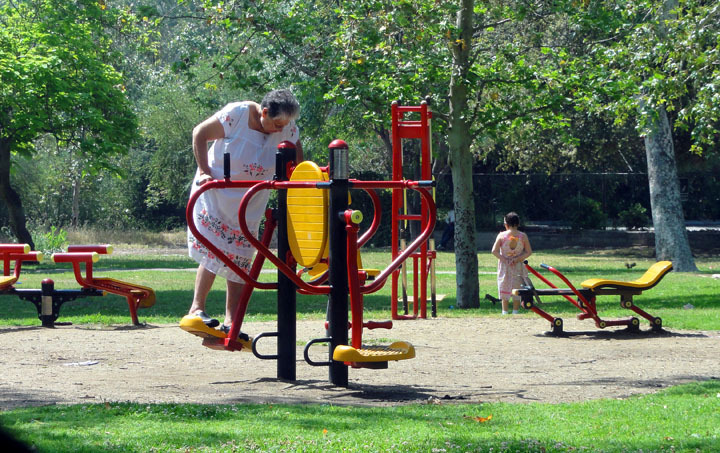 At Sycamore Grove Park on Figueroa Street we saw a grandmother exercising while her grandaughter wandered off. 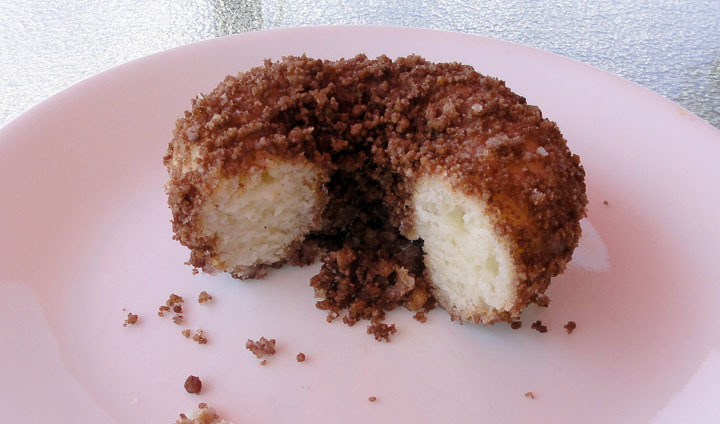 After our walk we purchased two crumb donuts from the excellent donut shop in nearby Hermon. Come walk with us and sample these donuts too! very nice, Wei…already looking forward to more… tomorrow “Siobhan, Baki and Kaya arrive! This is so neat! 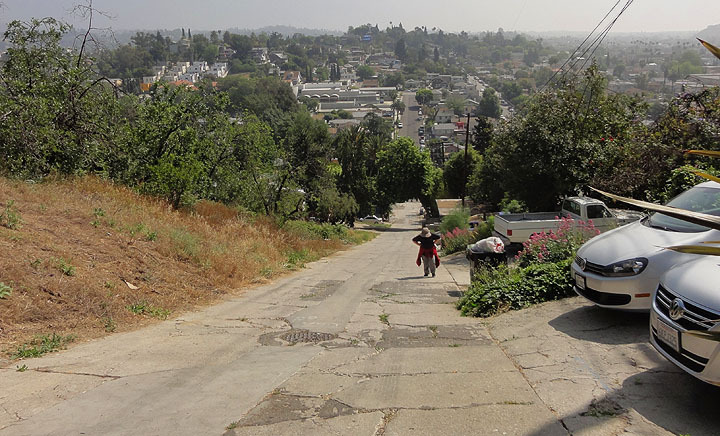 All that hill climbing though — I felt out of breath just looking at those stairs. Still, it’s worth it for those views!